Tomi Lahren is a Conservative wing nut commentator , and the host of her own show Final Thoughts on The Blaze Network. She recently made headlines when she compared the Black Lives Matter movement to the KKK , managing to piss off not only black people and minorities , but white people as well. She recently criticized Beyonce for her Superbowl half-time tribute to the Black Panthers , and Jessie Williams for his Black Entertainment award speech , accusing them both of being racist against white people. She also accused Colin Kaepernick of being a whiny-attention-seeking crybaby because he had the audacity to kneel instead of stand during the National Anthem to protest police brutality. But Tomi , along with her legion of anti-politically correct politically correct followers on twitter , being the real whiny-attention-seeking crybabies , attacked him like rabid dogs using racial epithets and telling him to leave the country if he didn’t like it. Not only has she insulted black people , she has insulted president Obama on numerous occasions , often referring to him as Barry , blaming him for the Chattanooga military base shooting by a Muslim , the Orlando Florida gay night club shooting , also by a Muslim , the deaths of the Baton Rouge , and Dallas police officers , accusing him of being more sensitive to Muslim terrorists , and of having a ‘friendly to Muslim jihadis’ mentality. In other words , he’s a friend of terrorists for no other reason other than the fact that his name is Barack Hussein Obama. She’s written her first book , White People : The New Victims Of Racism In The Age Of Obama , and has appeared on Fox News , and on The Daily Show with Trevor Noah. More recently she appeared on The Blaze’s Glenn Beck Show to warn Glenn , Stu , Pat , and their audience that Black Lives Matter really is a terrorist group like the KKK , and how they are shooting , lynching , burning , beating up , stabbing , and blowing up white people all over America who support Donald Trump , and white police officers. The Three Amigos , AKA as The Beanie Boys , Stu , Glenn , and Pat. 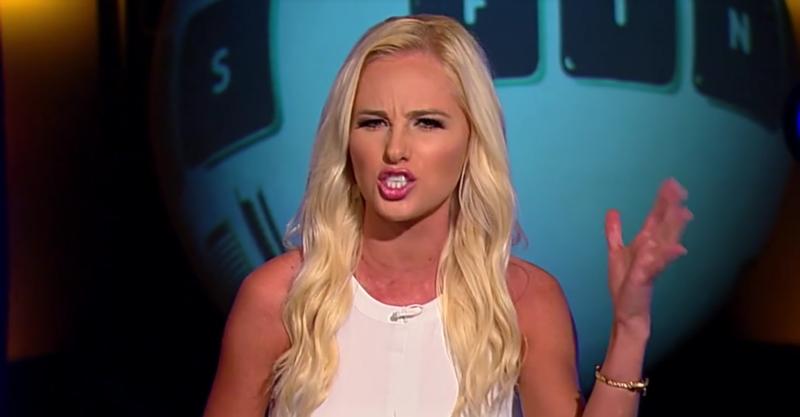 Angry white chick , Tomi Lahren explaining Black Lives Matter looters like to beat up and stab buildings when they can’t find white people to beat up and stab.